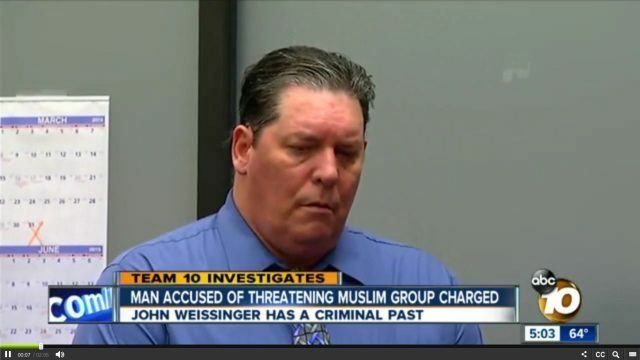 “It’s hateful, it’s caustic, it’s inflammatory, it’s dangerous, it’s illegal, it’s inexcusable and it cannot be tolerated,” Judge Timothy Walsh said of Weissinger’s behavior. In the voicemail and email threats, Weissinger used “horrible and evil” words and “once they went out, he couldn’t take them back,” the attorney said. The victim said that in the voicemail, Weissinger threatened to shoot her and fellow employees. She said she called police and gave them Weissinger’s name, which she got from caller ID. San Diego police Detective Dean Way testified last year that an assault rifle was found during a subsequent search of Weissinger’s home. The detective said Weissinger admitted leaving the voicemail and also sending a similar threatening email hours later to CAIR’s national headquarters in Washington, D.C.